Ewa’s and Peter’s Stratenwerth farm is located in a small village called Grzybów in the Masovian district, 90 km Northwest of Warsaw. Peter is from Switzerland, where he got a degree in biodynamic farming. In 1989 he moved to Poland and bought a farm that he has kept organic from its inception. Ewa was born and raised in Warsaw. She got her degree in biology and anthropology at the University of Warsaw and in 1992 she and her daughters moved to the countryside to live on the farm. Ewa’s and Peter’s farm has been certified organic since 1991 and manages a total of 28 hectares. More than half of this area (about 12 hectares) consists of meadows and pastures (8 ha), which feed the animals on the farm: 26 goats, 2 horses, 7 cows and 3 heifers. The remaining area (8 hectares) is used for the cultivation of cereals, legumes, pumpkins, beets, and buckwheat. 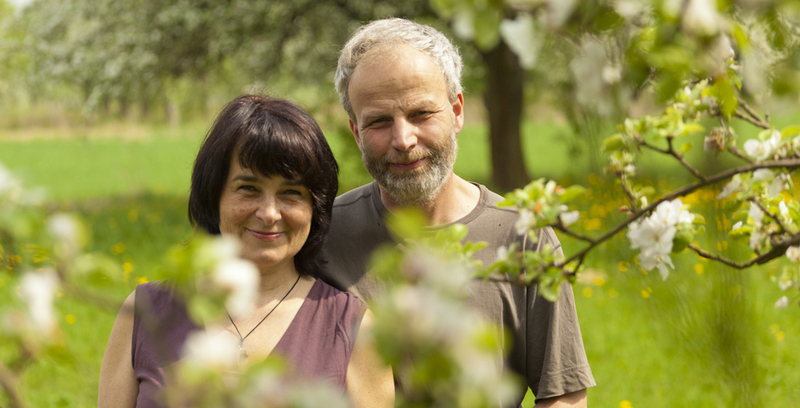 Ewa and Peter also manage a cheesery and bakery. The cheesery produces roughly 20 kg of a goat and cow cheese and the bakery roughly 1000 loaves of Hruby bread a week. The farm also has a mill to process the grains into flour for the bread, and wood-fired bread oven for the baking. The goods produced on the farm (mainly bread and cheese) are sold in dozens of organic food stores in Warsaw and Plock to about 500 customers every week.